Summer is the perfect time of the year to try out a new outdoor activity. However, if you are not well prepared, camping in hot weather can leave you exhausted, and you don’t like that to happen. In order to have a good time camping, you will need to do some changes to adapt to the environment. I am assured that the majority of you have experienced and know how difficult it is to sleep in hot weather. That is very tough, uncomfortable and annoying, which is why you will need to do something to prevent it. So, let’s consider your options. Tents come in different versions and materials, so if you are able to buy one especially for the summer season, that would be a big plus. 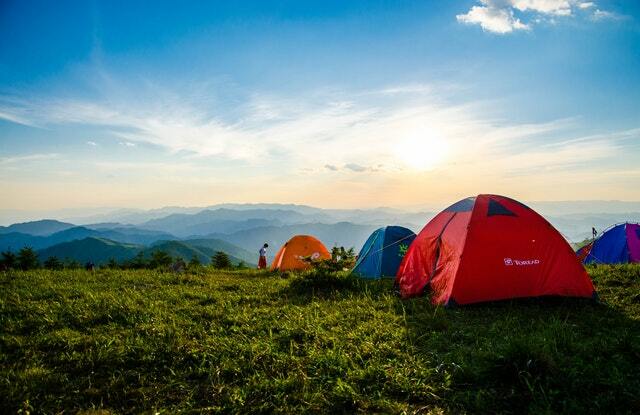 For summer camping, it is best to have a tent made of thinner material, like nylon for example. It would be a bonus if you can find a longer tent, possibly with windows, as they are much better for ventilation. To cover your tent from the sun, you might want to consider using a tarp. Tie the several tarpon trees around your tent and plan your space to get maximum effect. You should use a reflective tarp, as others will fail in creating 12ploa shade for your tent. The first thing you should think of is where would you position the tent. An ideal location will be one that will provide you with a shadow, as days in the summer are very long. If you don’t position your tent right, it might get scorching hot until it gets dark. It is possible if you can get your tent on higher land, to get the most out of the cooling effect. But notice one thing, you don’t want to be near the water, as high air humidity means higher chances of mosquito presence, and those insects can be very annoying. Once you take care of everything mentioned above, it is time to choose the right sleeping bag. For hot and humid weather, you will need a lightweight, breathable and compressible sleeping bag. To help you with the choice, there are several bags that you should look at. Designed for tall adults, this sleeping bag has a great design, allowing you to joint the left and right side together. The outdoor fabric is nylon, but the lining material is cotton, making it ideal for sleeping in the temperature range of 15-20 C.
Taller people might have issues finding a sleeping bag that will fit them, so if you are one of them, you should seriously check this one. A single sleeping bag has normal dimensions, and it is designed in a way that the pillow is off the ground, making it more comfortable. It is made of polyester, making it lightweight and soft to touch. You get two sleeping bags, although you can zip them and make a double bag. They are very practical and easy to carry, as you get it with a carry bag. You don’t need to worry about cleaning the bag afterwards, as they can be washed in a washing machine. This sleeping bag is the perfect choice for hiking or camping in the summer period. It is lightweight, thin, comfo;lk/*rtable and extremely durable. You don’t have to worry about cleaning it, as you have the options to choose to wash it by hand or put it in the washing machine. It is waterproof and weather-resistant which means it will prevent any kind of dampness. If you still didn’t make your choice, this sleeping bag is worth your attention. Made of polyester fiber, this sleeping bag has great dimensions to offer you a comfortable sleep. It has good ventilation, and it is skin-friendly. It is extremely durable, and it doesn’t fade. Since it is lightweight, it is easy to carry, and you get a compression bag for carrying it as well. If you are brave enough, you might even test this sleeping bag in colder temperatures. One of the best sleeping bags that you can find on the market- it is made of waterproof fabric, with no chances of getting cold or wet, while keeping the soft and comfortable effect. It is skin-friendly, waterproof and weatherproof, and you can use the zipper to adjust the sleeping bag according to your needs. It is breathable and ideal for hiking and camping. You can pack it in the carrying bag and use it in different weather conditions. With all of the mentioned things done, it is very probable that your tent will be cool enough for you to sleep. But, what if it isn’t? Well, in that case, there are several tips that can help you. Temperatures can get very high during the day, so if it is possible, disassemble your tent, as tents can absorb the heat. However, this isn’t necessary, and you probably won’t need to do this, of course, you have your tent placed in a good position, with a reflective tarp above. Portable fans don’t weigh much, they are battery powered and can run at all times. It won’t cost you much to get one, but the benefits from it are amazing. It will last longer and will help you fall asleep faster at night. In case you dislike the option with the portable fan, don’t be depressed, as there is much more you can do. First of all, drink lots of water. Staying hydrated will help you deal with the hot weather easily. A high percent of your body is water, and it takes much effort to change the temperature of the water. Next thing you can do, is to soak a towel in water and place it on your neck or on your forehead. This will help you in cooling your body off much faster. The last thing you could do to cool off is to take a cold shower. This doesn’t really need to be a shower, as you can substitute it with a short swim in a river or lake. The biggest dilemma is whether you should wear clothes, or sleep naked? It may sound weird, but it will be much better for your body to wear a shirt, even during the day. However, when choosing the right clothing, there are some rules you need to follow. Firstly, you should go for light-colored clothing, rather than dark-colored. Dark colors soak up sun radiations, while light ones reflect them. Because of that, when preparing for camping, you will only need to pack light-colored clothes. What about the material? It is best if you can use only clothes that are made of cotton or linen, as those materials are considered as light and breathable. Plus, it is better to sleep in clothing made of these materials, because believe it or not, they will keep you cooler. And what about cooking? How can you cook in extreme conditions? Keep reading to find out. It is normal to light up the fire so you can cook dinner, as during the night is not as hot as it is during the day. But for cooking breakfast and lunch, you might want to consider preparing something that takes less time to cook. You can take food that is easy to prepare or that you can eat it without cooking. I would suggest taking a cooler with you and fill it with fruit and water. Drinking plenty of water will keep you hydrated while eating light food and fruits will give you vitamins. To sum up, camping in hot weather is quite different compared to regular camping, as there are many things to consider. From choosing the tent material and finding the right position for your tent, up to choosing the right sleeping bag, you need to follow everything right in order to save yourself from the hot weather. As a bonus, you can find many tips that will teach you how to deal with possible sleeping issues, stay hydrated, and cool your body before going to bad. Last year I started vlogging. That means taking a camera with me to record video blogs of some of my activities. It was a fun hobby, a way to make my trips more interesting and actually make something productive out of them. I had even created a small online community and met some awesome people this way. I was taking it very seriously, getting a professional camera and all the equipment to go along with it. Plus, I was trying to make my videos more and more interesting. So far I had blogged about all kinds of local events, parties, traditions, festivities, festivals, all of it. My material was so good that certain people had requested to use it as an official promotion for their events. At least, the parts were I simply recorded the events, because most of the video actually included my face and my commentary. Another method that also was successful was blogging about adventures. My trips weren’t overly extreme or unusual. But people seemed pleased and interested enough in my hiking trips, trips down a river, exploring deserted beaches, things like that. I had a nice style, I supposed, plus the editing and the music helped. Mainly I think I was lucky that I managed to record noteworthy things each time. My latest plan was camping. That would make up for a longer video. Hopefully my greatest yet. And who knows, venturing alone in the woods sounded like great content, the perfect way to run into interesting things that would capture the attention of my viewers. Better yet, I made the most out of it and made an entire introductory video about getting ready for my trip. I was staying just one night, but I would leave early the day before and come back late the next day. So, all about packing, what to take, what not to take, what to check, where to get information, basically sharing all I did, including my funny mistakes. Finally, the day arrived. It was just me, my supplies and my camera. I was narrating the whole process. The people that crossed paths with me either smiled and wave or looked at me strangely, but it was fun. I was already having a great time. I continued to walk, managed to record a fun near fall I had, then the real fun started. Even though I moved around for a bit, I didn’t see anything, and I’d have to edit that completely out of the video, I thought. I stopped recording for a while, trying to get a little farther. But I heard the mysterious noise again. So, I looked around once again but didn’t catch sight of any kind of animal. In the end, I brought my camera out again, it felt a little bit like the company and I didn’t want to admit it, but I was getting nervous. “Uh, I’m back,” I introduced myself as if microscopic people had been waiting for me inside the camera, “the woods are alive, that’s for sure. But, very important, it seems that I don’t know everything that’s happening around me, weird, huh?” I joked to my imaginary audience. My fake enthusiasm to hide my nervousness didn’t help much. At least I was content knowing that my fear would make up for really enjoyable content online. Luckily, I managed to reach the camping site without only a few more jump scares from unknown noises around me. I wasn’t thrilled to see I was the only person camping there that night. Making the most out of my situation, I allowed myself to be as ridiculous as possible, embarrassing myself and openly explaining the entire process, plus all of my mistakes that I didn’t think of earlier. But hopefully, people would benefit from watching me embarrass myself. However, when I got my tent ready, it happened again. The strange sound was back. It was a rustling of leaves, a presence there, something moving that I couldn’t see. I couldn’t help it, and I immediately ran into my tent. I got inside as if it would protect me from anything in the world. I had all my stuff, a flashlight, some snacks, my camera, and the brave tent to protect me. I was becoming a mess, apparently, “I’m not scared, I’m not scared,” I promised to my imaginary audience, “I’m just terrified, and I’m not leaving this tent until the morning,” I finished with a smile. It was embarrassing, of course. I made a fool of myself, obviously. But the sound was there! And it was scary! I wasn’t trained for that. I had no idea what to do about that. I had skipped the article about what do in case you run into a wild animal. I didn’t even know what kind of thing was hiding outside my tent! In the morning, I put my head and my camera through the opening of the tent, I looked around suspiciously and, to nobody’s surprise, I saw a bunny sleeping peacefully a few feet away. Effectively, that one remains my greatest vlog.